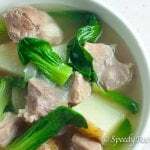 Filipino Pork Nilaga Soup is a Boiled Pork Soup with Potato and Bok Choy. It is a simple way to prepare soup the Pinoy style. It goes with rice and is best with some spicy fish sauce on the side. Typically, the spicy fish sauce dip is simply fish sauce with chopped spicy chili. Siling labuyo is the hottest chili that originated from the Philippines. This is around 50,000 to 100,000 Scoville units. 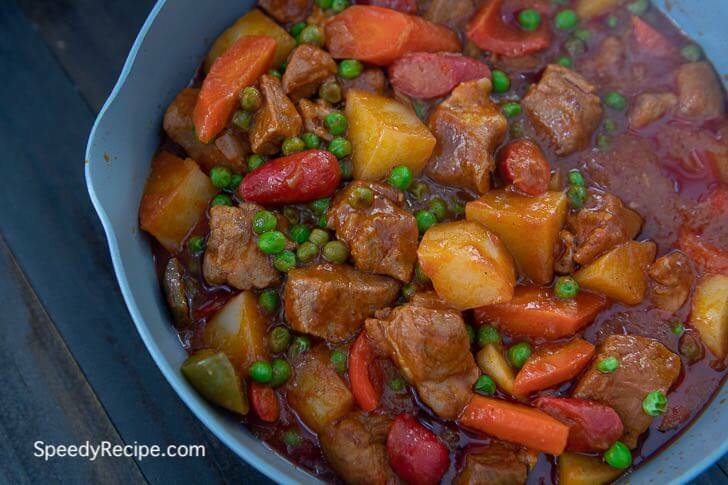 Aside from the ingredients that we have for this recipe, other vegetables can also be used. For example, cabbage or Napa cabbage can be used instead of bok choy, or you can use both. Carrots can also be added once in awhile, but it is not common. Saba banana or the sweet plantains of the Philippines also make a great addition as it gives the soup a sweet taste. Traditionally, Filipino soup dishes are clear and based on chicken, pork, or beef. A similar soup is called Bulalo, wherein beef shanks with bone and marrow are used instead of pork. Chicken soups such as Chicken Tinola is also a favorite because it is packed with nutrients brought about by the ingredients. Malunggay leaves and hot pepper leaves are some of the healthy greens that make-up tinola. Filipino Pork Nilaga Soup is perfect to have on a rainy day. Its hot broth can keep you stay warm and toasty. 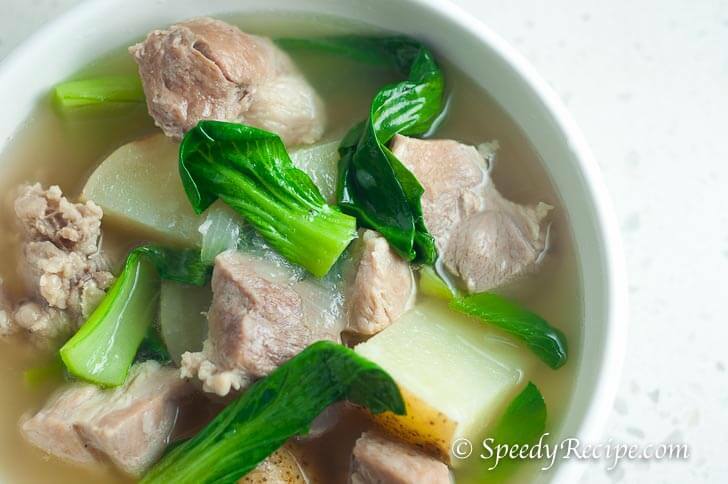 Try this Filipino Pork Nilaga Soup. Enjoy! Cut the lower end of the bok choy. Set aside. Slice the potato and onion. Set aside. Meanwhile, pour water in a cooking pot. Apply heat. Pour-in beef broth. Let boil. Once the liquid starts to boil, stir-in onion and pork. Cover and simmer for 40 minutes or until pork gets tender. Add water or beef broth if needed. Add the potato. Cover and cook for 8 minutes. Pour-in the fish sauce and add the bok choy. Turn the heat off. Cover the cooking pot for 5 minutes. Terrific recipe. Quick, simple and very tasty. Thumbs up. why are you using beef broth instead of pork broth? I would use pork broth if there is one commercially available. Can you by pork broth, by any chance from your location?